Mini Peach & Fried Pie…..
It’s peach time. 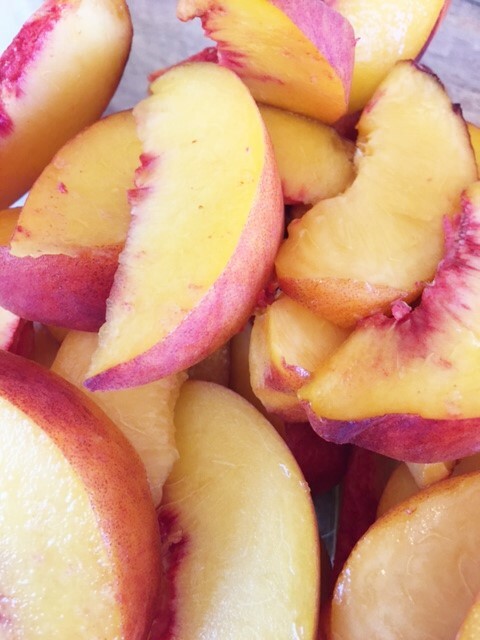 Peaches are in abundance and so juicy and sweet this year. I have been buying pounds of them and have made so many things with them. 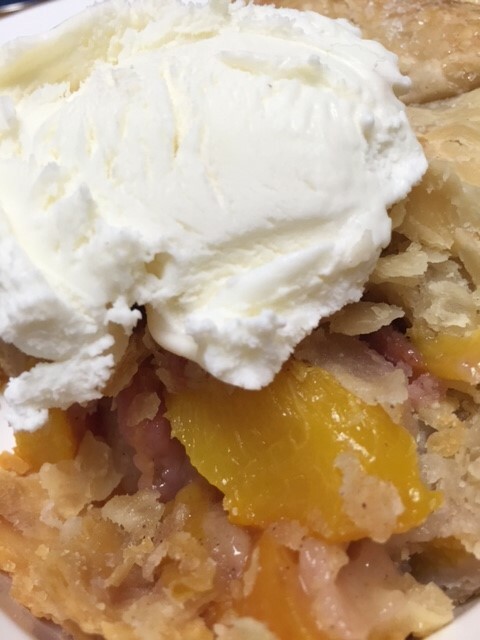 This week will be a week of peach posts…….peach fried pies, peach sangria, peach simple syrup, peach iced tea, and a delicious copycat peach drink from a well-known Aussie restaurant. Ohhhhh, you’re going to love that one. So check back this week. I hope you like peaches! ok, so….one of my favorite pies is a good peach pie. I was watching one of the food channels and they profiled a restaurant that made fried pies. I love fried pies. I was drooling as I watched them making those heavenly things. I immediately went to the kitchen and had to make one. I have made them with homemade crusts, but the best ones I think, are from the store-bought crust that you just unroll. So, this makes fried pies so easy to make! You can use any pie filling, but whether you use a ready-made crust or make your own, just make sure your filling isn’t real runny. I also made a couple of mini pies in ramekins. Those are fun too. It’s great to serve guests their very own little pie. So, I suggest you go buy plenty of peaches cuz I have some good recipes coming up. Stay tuned….. Note: for the fried pies, you will cook your filling first (see below). For the mini pies, you don’t have to cook the filling first. In a medium-sized pot, mix together the peaches, sugar, cornstarch, lemon juice and cinnamon. Cook over medium heat till thickened and it doesn’t taste like cornstarch. Allow to cool. Cut circles out of your crust, big enough to be able to fill and fold over. Spoon some peach filling onto your circle of crust. Fold the top half of your circle of dough down to cover the filling. Dampen the edges and seal. Place approx. 2″ of oil into a pan and heat it to medium high heat. Very carefully place your pie into the oil. Only fry 1 or 2 at a time, until golden brown. Remember the filling is already cooked, so you only need to brown the crust. Place on paper towels to drain the oil and immediately sprinkle with sugar or cinnamon sugar. Allow to cool before you bite into it. Cut a circle of pie crust dough that is bigger than your ramekin. Fit dough down into and up the sides of the ramekin, like you would in a pie pan. Place a good amount of peach filling into your ramekin. Cut another circle of dough to fit over the top of your filling. Crimp the edges of dough together. Make a slit on top of the dough and bake at 375 for about 30 – 35 minutes. Crust should be golden. Allow to sit out and cool. Serve with ice cream!